The Berry Schools respond to Mr. Williams' letter regarding Mr. Ochs' fund raising in Miss Berry's absence. The Schools ask Mr. Williams not to use that story with the other stories about tourism since the campaign hasn't been completed. 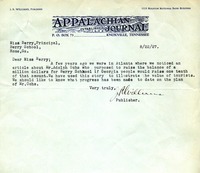 Letter from publisher of Appalachian Journal regarding an article about raising funds for Berry School. 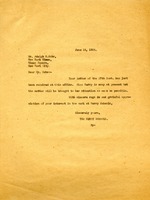 Wants to know what progress has been made to date on the plan of Mr. Ochs. 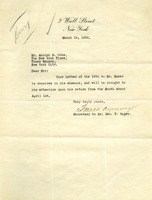 The Berry Schools informs Mr. Ochs that they received his letter and that Miss Berry is away, but the matter he addressed in his letter would be brought to her attention upon her return to the schools. They also thank him for his interest in the schools.